Super Tiny Computer Puts Android on Your TV, Laptop-with a side of Raspberry Pi – Carpet Bomberz Inc. Early this year we got to see, through ARM-powered devices such as the Motorola Atrix, that it doesnt take even a netbook to run basic computing functions. At a live demonstration in New York City, FXI Technologies showed off the next evolution of that idea: an ARM-based computer on a USB stick without any of that extra smartphone or tablet baggage. via Super Tiny Computer Puts Android on Your TV, Laptop. As time marches onward, the term we use ‘computer’ becomes more and more diffuse. Consider the cell phone, is no longer a phone but a computer connected to a network and can act like a phone. Or your TV is a computer that is also connected to a network and you can watch broadcasts or streamed videos or attach it to a game console. 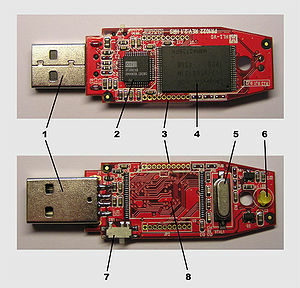 Now what if you could turn any bit of electronics with a usb connector and a video display into a bona fide computer? Size is no limit when using a mobile cpu like an ARM chip. As Android evolves I hope too that efforts like Raspberry Pi show what can be done in a wholly Open Source context. FXI Technologies is showing us the way, but so are other efforts like the Raspberry Pi computer too. I attended a workshop this past Summer sponsored by RedHat covering a wide range of topics including Open Source communities. The main technical person leading the workshop also volunteers some of his time to Mozilla, specifically Mozilla target to ARM cpus, like the Raspberry Pi computer. He told us a little bit about how astoundingly cheap that device is as it was originally intended as the main board for the Sling Box time shifting TV controller. The first generation design was meant to be as low cost as possible but it didn’t quite make it to market. Succeeding generations of the original design did make it to market, as did the custom ARM CPU that Broadcom created to put in the original design. That CPU has now given birth to the Raspberry Pi project using the Broadcom BCM2835 System on a Chip (SOC). This is an ARM 11 based core which puts it just a bit ahead of Apple’s A4 and A5 iPhone/iPad cpus which have used ARM8 and now ARM9 cores for it’s central processing unit. Cost is of course cheap compared to anything else calling itself a computer, or a tablet and this is the reasoning behind making the board layout open source along with targeting a Linux distribution specifically for this computer.